The DCS-8300 offers you both the easy operation of an analog oscilloscope and the high functionality of a digital oscilloscope. With its high-intensity CRT, high-speed single events can be easily observed. 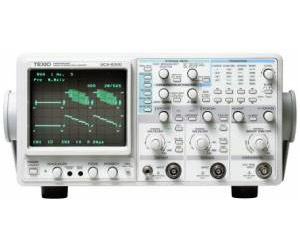 The DCS-8300 has a variety of trigger functions to catch many different waveforms. It also has a 40 MS/s AD converter in each channel and a maximum sampling speed of 100MS/s is achieved in 1 channel mode. A large capacity of 16K words memory for each channel makes long-term record storage possible. A selection of optional interfaces (GP-IB or RS-232C) is available. When these options are used, the DCS-8300 can be controlled by PC or waveform data can be stored in a PC.